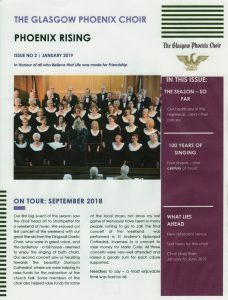 The latest edition of the choir newsletter “Phoenix Rising” has just ‘hit the news-stands’ and you can read it here (click on the image). If you would like to receive your own personal copy of future editions, straight to your email inbox, then email our Publicity Officer (anronne@yahoo.co.uk) and she will add you to our mailing list. 100 Years of Choral Singing – Congratulations !